This document explains the minimum hardware and software requirements for obtaining an angular position measurement from a Fredericks electrolytic tilt sensor. Figure 1 shows the major components required to create a functioning tilt measurement unit using an electrolytic tilt sensor. As you will see later on, it is important to avoid direct current to the sensor. We therefore suggest the use of an operational amplifier with high input impedance such as the LMC6482 from Texas Instruments. This will limit current leakage to ground and in turn, direct current to the sensor. Figure 2 shows the circuit equivalent of a single axis electrolytic tilt sensor. Let’s continue with the excitation signal for the sensor. The excitation signal is provided by the microprocessor with the simplest case being a single axis sensor. A single axis sensor requires two output ports of the microprocessor which are connected to the outer pins of the sensor. The ports are toggled with a 50% duty cycle and a period of between 200 and 1000 hertz. See Figure 3. Precise timing in software is required to maintain a 50% duty cycle to prevent asymmetry in the sensor excitation signal. See Figure 4. Asymmetry is defined as direct current to the sensor which causes drift and ultimately permanent and irreversible damage to the sensor. This can be explained chemically; direct current causes electrolysis to take place, eventually rendering the sensor inert. Each bit in port_b now corresponds to a pin on the chip. The most significant bit is pin B8 and the least significant bit is pin B0. Let’s assume a single axis sensor is connected to pins B0 and B1. See Figure 3. If you are using a dual axis sensor, let’s assume it is connected to pins B0, B1, B2, and B3. In this example, timer1 is a 16 bit counter (0 to 65535). This means that it will count up from the value set by set_timer() and when it overflows (reaches 65535), an interrupt will be generated and the code within the timer1_isr() function will be executed. The amount of time that it takes to overflow is defined by a variety of factors including the microprocessor clock speed and the timer1 setup parameters, among others. It is important to maintain an interrupt time of between 1 and 5 milliseconds to ensure proper excitation of the sensor. Refer to the manual of your individual microprocessor for this information. The port toggling works by using the modulus function. Each time an interrupt is generated, isr_counter is incremented and modulus 4 is performed on it. This essentially makes a counter that counts from 0 to 3, incrementing with each interrupt. This accesses each of the four states stored in output_arr that comprise the excitation signal. Now that we’ve created an excitation signal, let’s examine the sensor’s output. The output is an analog voltage referenced to the excitation voltage. The output must be read in phase with the excitation signal. It is suggested to take multiple samples during each of the four states (two states for a single axis sensor). The waveform in Figure 6 shows an example output from the analog to digital converter connected to the output of a dual axis sensor. This particular output indicates a positive tilt angle for both the x and y axis. See Figure 7 for an output indicating a negative tilt angle. As you can see, within each state of the excitation signal we are collecting 8 samples with a 0.1 ms delay between samples. These samples can then be averaged in the data analysis code to provide a more stable and accurate result. By referencing the isr_counter we are able to ensure that the readings are taken in phase with the excitation signal. All sensors have mechanical tolerances and their operating specifications often only indicate a portion of their total range. Additionally, the above calculation assumes a linear, symmetrical, and centered output from the sensor and this is typically not the case. It is therefore important to characterize the specific type of sensor you are using in your application in order to derive the true tilt position. Knowing the number of counts per degree allows you to easily convert a reading from the analog to digital converter to an angular position. Further compensation for linearity, symmetry, and zero position will significantly increase the accuracy of angular calculations. As with all software, there are many different ways to accomplish the same goal. 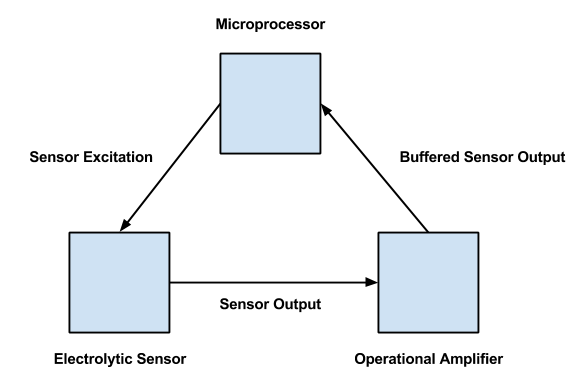 This document simply presents one example of how electrolytic tilt sensor signal conditioning can be achieved through the use of a specific microprocessor and compiler.